Victoria, BC, Canada – Reliable Controls is honored with the 2017 Project of the Year award, presented by BACnet® International. The award is given to a merit-worthy project posted to BACnet International’s Success Stories website. 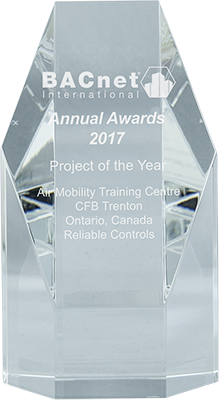 This award recognizes the Air Mobility Training Centre (AMTC), CFB Trenton, in Ontario, Canada. The AMTC is one of the most complex facilities of its kind. Built to house the equipment and personnel required to train pilots and maintenance crews for the new CC-320J Hercules aircraft purchased by the Canadian Forces, it will also provide support to troops serving in combat, as well as for peace keeping and humanitarian missions around the world. Reliable Controls Authorized Dealer R.E.L. Controls Inc. completed this new construction project almost $20 million under budget. The award ceremony took place in Las Vegas, NV, on January 29, 2017. BACnet International Managing Director and President Andy McMillan, Marketing Committee Chair Rocky Moore and Education Committee Co-Chairs Steve Karg and Scott Ziegenfus were on hand to present the awards. The Annual Awards are bestowed upon deserving individuals, companies and projects in recognition of outstanding achievements in several categories, including Volunteer, Member, and Project of the Year. BACnet International is an industry association that facilitates the successful use of the BACnet protocol in building automation and control systems through interoperability testing, educational programs and promotional activities. BACnet International oversees operation of the BACnet Testing Labs (BTL) and maintains a global listing of tested products.